The Return of H.M.S. 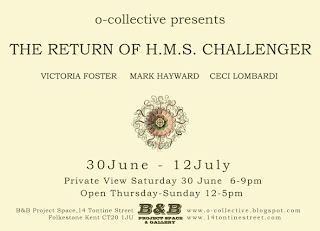 Challenger is the second group show organized by the o-collective, presenting the work of three emerging artists Mark Hayward, Victoria Foster and Ceci Lombardi. The show has been curated by Marco Palmieri and Ceci Lombardi. In the form of traditionally bound monographs, black and white bill board posters, videos of simple animated drawings, hand made porcelain barnacles, the artists have created what seems to be an exhibition presenting the discoveries and studies of a group of explorers of the late 19th Century. 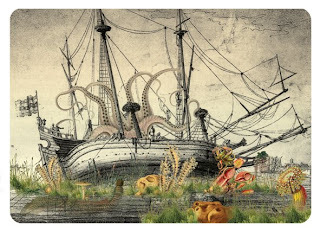 It is the conflicting relationship between science and fiction, history and myth, research and imagination which links the works of these artists.